It has become even more popular recently because the frozen yogurt chain called “Pinkberry’s” uses the system for their restaurant floors. This is a process that most homeowners and small contractors can do themselves. The most difficult part of the process is usually locating a good supply of stones. The best size are small smooth pebbles in the 1/8″ to 3/8″ size range. Check local material suppliers, quarries, brickyards, home centers, and dealers in concrete and accessories. Smaller pebbles give much better results than large pebbles. Before tackling a large area, do a small test on a small area to gain experience working with these materials. This is especially important when using white pebbles because epoxy is not UV resistant and yellows in sunlight. Where do I find pebbles? Search for a local brick, paving, concrete or stone supplier. What is the work life? 30 minutes for the mixed epoxy. Adding pebbles to the epoxy increases the work life to approximately 1 hour. How do I clean and prep the surface prior to application? This epoxy is an extremely tenacious adhesive and will bond to almost any substrate. You don’t need to take any extreme measures. Clean the area very thoroughly to remove any dirt or debris. Remove or repair any broken concrete and fill or repair all cracks. If you wash it, allow time to dry completely. 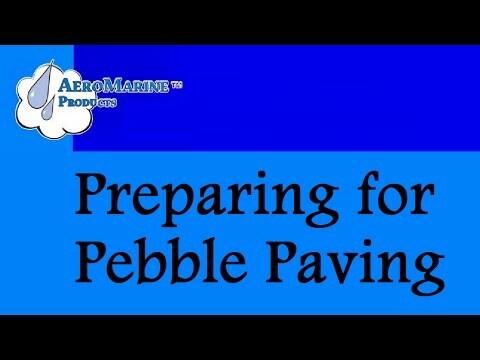 AeroMarine Products Pebble Paving epoxy will not bond to greasy or oily areas! Do I clean and prep the pebbles? Only if they are really dirty. Rinse them with water and let them dry completely before mixing them with the epoxy. Should I prime the deck? Professional applicators that guarantee their work generally prime the surface with a thin coating of mixed epoxy. Most homeowners generally just trowel the mixture directly onto the surface. Both are acceptable practices. Does the surface need to be dry before application? If new construction, the concrete slab should be what minimum thickness? It must meet the building codes in your community as if it were a standalone concrete slab. The epoxy and pebble layer should not be considered a structural component. What is the recommended thickness of the pebble and epoxy layer? The thickness of one to two pebbles – generally ¼” to ½”. With a trowel, similar to how you would smooth concrete or apply stucco. What’s the best way to mix epoxy and pebbles? First, thoroughly mix the resin and hardener, then add that mixture to the pebbles. If it’s a small application, you can mix it by hand in a concrete mixing trough. Disposable plastic troughs are commonly available at hardware stores. If it’s a large application, use an electric cement mixer. The goal is to completely wet each pebble with epoxy, but just barely. Excess epoxy will just drip down between the pebbles to the substrate. The objective is to create a mixture resembling a “rice krispy” treat. Can I flood-coat the pebbles with epoxy to make a smoother surface? NO! An epoxy flood-coat will yellow in the sunlight. Your epoxy and pebble mixture should be dry, with the pebbles just barely wetted out. Remember the “rice krispy” treat-like texture described above. How long does it take to reach full cure? Generally, it will cure in 24 hours. However if you plan to drive on this surface, let it cure for 72 hours. Winter weather conditions may lengthen the time required to cure. It will be fully cured in 7 days at 70F. What happens if it rains before the epoxy cures? Try to apply the epoxy when you are certain it will not rain in 24 hours. If the epoxy is exposed to rain or water, which includes your sprinklers or heavy mist/dew, it may turn a whitish color which can not be changed. How do I repair an existing pebble paved surface? For small repairs, mix epoxy in a coffee can or other disposable container. Using disposable gloves, add pebbles as needed to create enough material to complete the repair. Apply with a trowel or spatula. Larger repairs are similar to a new applications. Mix the resin and hardener, add the pebbles in a mixing trough or wheel barrow, and apply with a trowel. How often should I re-coat the pebbles with epoxy? We recommend recoating residential applications every 4 years, commercial applications every 2 years. It can be applied just like paint using paint rollers. For light re-coats, a medium nap paint roller works well. We frequently receive questions about installations that haven’t been recoated for 12 to 15 years. At the point, it’s best to apply a thick coating to refresh the installation. The best way to apply a thick coat is with a thick nap roller or an acoustic ceiling roller. 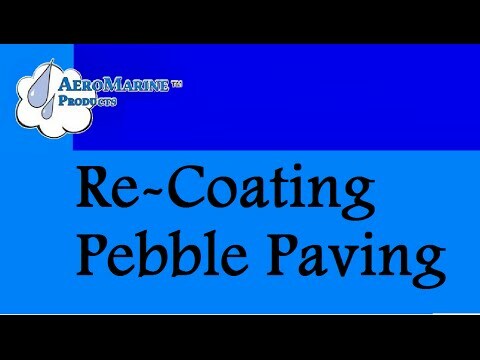 When purchasing AeroMarine Products Pebble Paving epoxy, consider the reduced coverage achieved when applying a thick coat. What temperature and weather conditions are required? Application must be done during dry conditions, at temperatures above 50 °F. Applications at temperatures over 100 °F tend to cure much faster than applications made in the 70 °F range. Cure time is affected by ambient temperature and size of the batch. In extreme heat, mix smaller batches. How do I apply it to a vertical surface? Application onto a vertical surface can be very tricky and is not recommended. The epoxy has the look and feel of clear 30 weight motor oil, and tends to drain rapidly off vertical surfaces. The best way to apply the epoxy and pebble mixture onto a vertical surface is to wait until it has started to gel before application with a trowel. If the mixture slides off the surface or pebbles fall out, then the epoxy is still too green. Keep working it on to the surface until it stays. Also, keep in mind that the work life is now shorter so plan to complete smaller areas in each batch.